This (from the bottom) shows the A414 coming from Chelmsford, crossing the small river just before Danbury, before running in past the North side of the Danbury Park, past Well Lane which is the road indicated at the top of the park on this map. 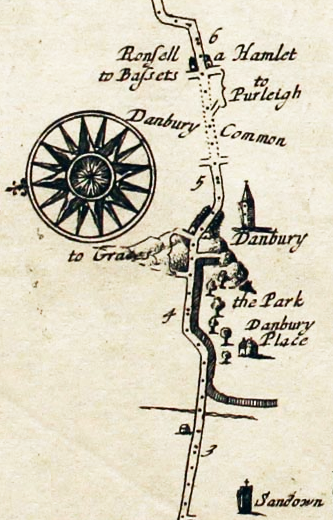 Then the route runs through the only built up part of Danbury in 1675, along the part of the A414 that runs past the church. The cross roads just above the number 5 is Eves Corner, just after which the road becomes a dotted line as the diagonal entry to Gay Bowers runs off ‘to Purleigh’, so it may be that this part was just a dirt track through what was then known as Danbury Common (in a different area to the place where the Common is now). Aside from being the oldest map of Danbury that I know of (beating the previous oldest by some 80 years), it also has the earliest depiction of Danbury Place – at a time when it was still owned by a veteran of Newbury. Why inopportune? Because you’ve decided to live in a world where rubrication, the very subject you were clearly interested* in reading about, is a forgotten art. About a month ago now I bought a very large fragment of Saint Augustine’s Commentaries on the Psalms, an incunable copy printed in 1497. Unlike any of my other incunables, this one is rubricated, an excellent way to jazz up any page that is sadly jazz-less, and something that would certainly make those business reports that you just finished look much, much nicer. What is rubrication then? Firstly, it’s a great word, just look at all those letters. It basically refers to the practice of ‘beautifying’ printed books by adding coloured sections of text and initials (traditionally in red ink), and was common from the time of medieval manuscripts right the way through to the start of the eighteenth century. (Although granted a lot less common later on in its practice.) 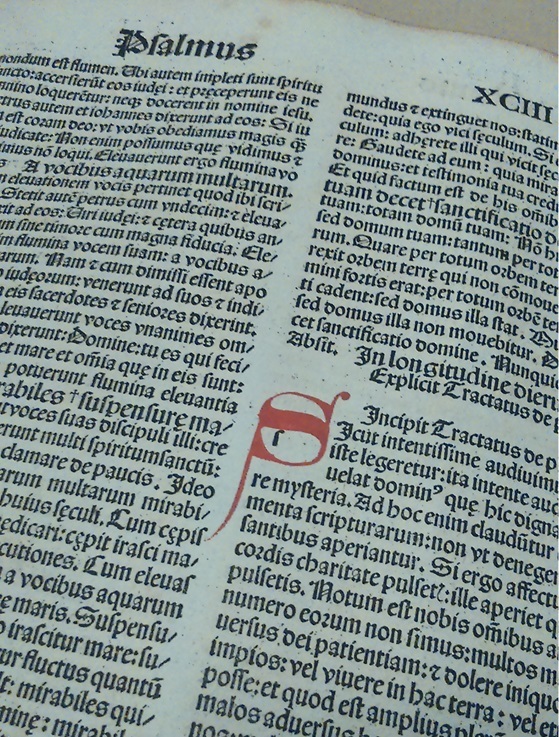 In very early books such as my incunable or even the manuscripts that pre-existed it, this involved leaving huge gaps around the first letter of different sections within the book, so that a larger initial could be hand painted over the top, much like the grand initials found in illuminated books. It also included things such as underlining, adding marks to indicate sections, and adding in important parts of the text in coloured ink. 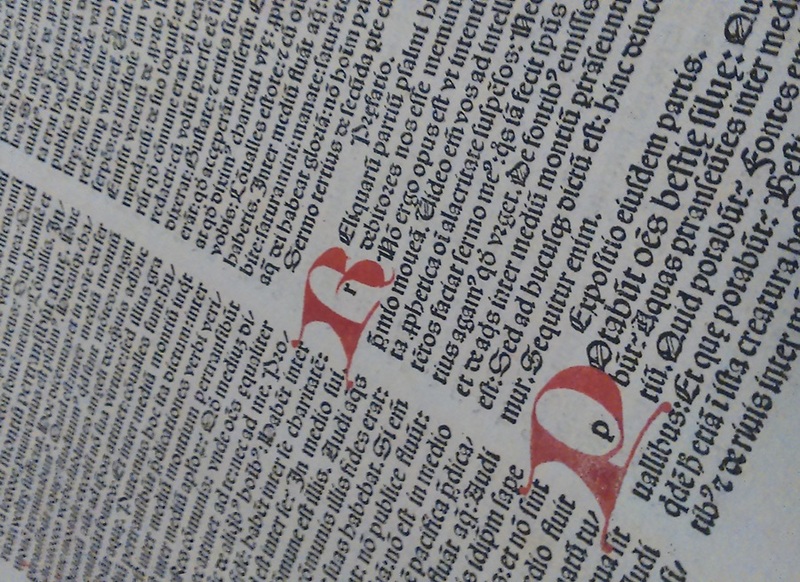 Usually any occurrence of rubrication at any date later than the mid-1500s involves solely the underlining of text or line borders around pages. For those really interested, it was different to illuminating a page because technically illumination has to involve gold leaf. Sadly the growth of printing and the increased availability of books killed off the wonders of rubrication; as it became easier to print large initials and underline text using the printing press rather than doing it by hand, books slowly lost any need to be beautified after they were printed. This, plus the fact that books became cheaper and less important, so were not really worth putting time into improving them by hand, meant that now the word rubrication has almost been forgotten from our language. But, reader! What if it were around today. Imagine scores of scribes sat by every printer in every office, taking whatever the inkjet spewed out and running over it with a quill and brush, picking out initials in beautiful gothic style, adding borders, even illustrations to the page margins. Now that, reader, is a world I think that I would enjoy, and would perhaps remind us of the importance of the printed word. Forget handing in a boring dissertation of page after page of text, and instead imagine it flowing with fine hand-painted section headings and grand initials, bordered with hand-drawn imps and minstrels, what could be more excellent? Try this with your CV next time you’re going for an important job, I’m sure it’ll all be fine. *By assuming the fact that the word interested you, I do by no means suggest that this post is interesting, in fact you should go watch the tennis instead.